Card Text Before Fight: Deal 1 to each enemy creature. Flavor text Guess how he got that name. 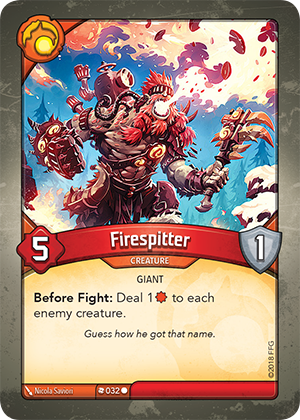 Does Firespitter deal 1 damage to each enemy creature when it is attacked? No. “Before Fight:” abilities are only resolved when a creature is used to fight (i.e. when it is attacking).